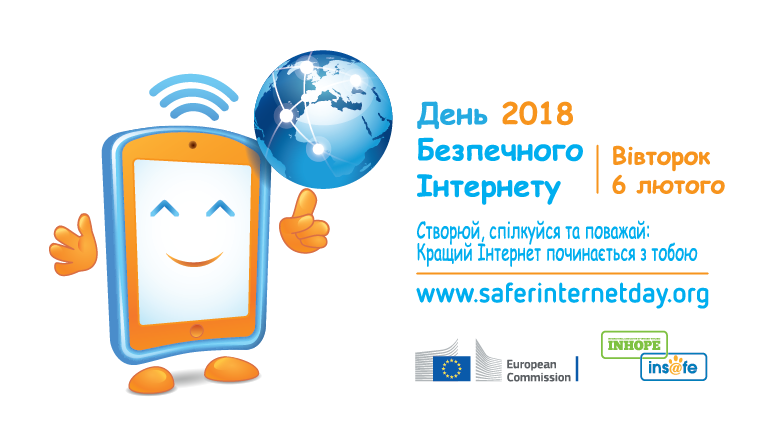 Safer Internet Day 2017 in Ukraine – Старт – почни з себе! Ukrainian state and non-governmental organizations, business and educational institutions, media, libraries traditionally celebrated Safer Internet Day together with the entire world. From this year, Ukraine SID Committee has regional coordinators and today our team is growing for more successful promotion safer and better Internet across Ukraine. On the eve of the Safer Internet Day, 6 February 2017 a round table «Child online: how to ensure security and privacy?» took place in Kyiv, Ukraine organized by NGO «Partners of digital rights protection» and Ukraine National Committee of Safer Internet Day with the support of the Ukrainian’s Parliament Committee for Informatization and Communications. Analytical research «Child online: how to ensure security and privacy?» was prepared and published for this activity. On the round table representatives of the state, business, civil society organizations and children themselves identified crucial need to strategic development and implementation of national policy to protect child safety and children rights online in Ukraine. This can be possible due to joining the European networks of Awareness Centres (INSAFE), hot lines (INHOPE) and through the creation of the Safe Internet Centre in Ukraine. 318 organisations registered for the Safer Internet Day activities in Ukraine and received Open Badge «Organizer of SID 2017 activity in Ukraine». 26 630 children, young people, teachers took part in registered activities. Some of these organizations managed to conduct parallel activities in 7 or even 11 schools in their region of Ukraine. SID 2017 key messages (in Ukrainian) have more than 4772 views and downloads. The messages were recognized by stakeholders as a useful resource for the SID activities. Human rights in the Internet. Manual for educators and youth workers had more than 1600 views and downloads and used as a methodology for the SID activities by NGO activists, teachers and librarians in Ukraine. Ideas for parents created by the SID Committee were vaery appreciated by teachers and parents as well as local authorities, which put it on the city\town official web sites. The SID Committee initiative #saferinternetchallenge gave an impetus to thousands of children, young people, teachers, parents, media and Internet-providers to create their own online safety promises for 2017 and to share it through social networks. A Forum «The digital transformation of education» has been organized by GoogleEducatorGroup Ukraine for more than 70 Ukrainian teachers. Two all-Ukrainian webinars for children and youngsters, parents and teachers from 250 educational institutions, libraries were conducted by the coordinator of the SID Committee and organizing by the Institute of Modernization of Educational Content of the Ministry of education and science of Ukraine and Microsoft Ukraine. It is only some part of different trainings, seminars, discussions, meetings, press conferences and other events that were organized on different levels by numerous stakeholders in Ukraine for safer and better Internet.